Welcome to Salisbury Little Athletic Centre. We cater for children from 3 to 16 years of all abilities. Little Athletics offers athletic pursuits through fun and games as well as skill enhancement. No matter if you are an elite athlete, just want a bit of fitness or have a disability, we are here for everyone. 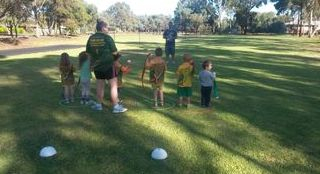 Competition days are usually held on Saturday mornings at Creaser Park, Lavender Drive, Parafield Gardens. Occasionally we visit other Centres in the area as well as State Competitions held at Stadium SA, Railway Terrace, Mile End. All children participate in a variety of events each week including sprints, distance running, race walking, long jump, high jump, shot put, and discus just to name a few. The focus of Little Athletics is to improve on your own achievements not just on who comes first. Training is available on Tuesday and Thursday nights from 4.30pm - 5.30pm once the season commences. Training is not compulsory but is available for all athletes. Trophies and medals are awarded at the end of the season with opportunities to earn others as well as certificates throughout the season. Click the next button and complete your details. At the end you have the option to pay by Credit Card online which will attract a service charge that you will need to pay. Alternatively you can just register and elect to pay later. You can pay by Cash or Cheque at the Centre or elect to pay by Direct Credit into our account. Please note that the system has an error that the Association is trying to correct. At present the system charges you an Admin fee of 6.6%. This is incorrect and you DO NOT need to pay the extra fee just the correct Registration Fee. Account details are: Bendigo Bank BSB 633-000 Account number 148422884. Your Information pack can be collected on Registration Day or at any Home Competition. Interested in a Come and Try prior to committing for Registration. You can complete the Insurance Form by clicking the button below. Weekly Fee is $2 per athlete to assist with oval maintenance.